Thanks to Catherine Criswell, Claire McMahon and Visible Voice Books for making this special edition of 100TPC happen. 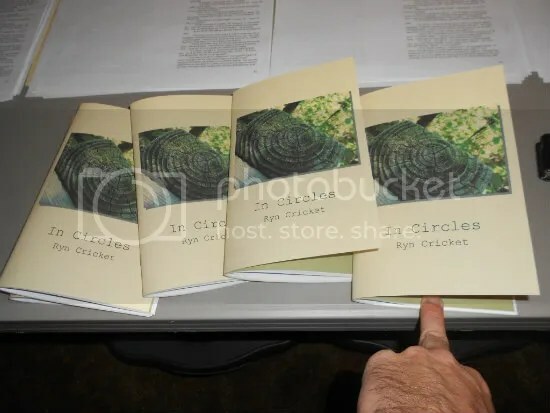 Crisis Chronicles Press is pleased to announce the publication of Ryn Cricket‘s debut chapbook, In Circles, on 21 September 2012. In Circles features 28 pages of stories and poems by Ryn Cricket (a.k.a. Katheryn Womack), in which the exceptionally normal, abnormal, paranormal, all-too-true and extraordinary mingle and thrive. This special handbound edition features a saddle stitched cream and olive green card stock cover emblazoned with a Mark Darus photograph. To order by snail mail, send $7.50 (includes postage) to Crisis Chronicles Press; c/o John Burroughs, editor; 3344 W. 105th Street #4; Cleveland, Ohio 44111. For more, follow Ryn Cricket’s blog at http://katherynpeace.wordpress.com. Editor’s note: Ryn has been living in Thailand, but will be back in northeast Ohio for the next month or so before heading China to start new yet again. I’m in the process of trying to set up a couple of readings for her while she’s here. Stay tuned for details. The last time I planned to visit and read at the famed Temple of Tolerance in Wapakoneta, Ohio, we got rained out. A year and a half later, on Saturday 15 September at 7 p.m., it’s finally gonna happen. Looking forward to performing at this most unique venue! Poetry at the Temple will feature Dianne Borsenik, Michael Grover, John Burroughs and an open mic — hosted by Mark Sebastian Jordan in association with the Ohio Poetry Association. The advantage of reading with such poets is that even if I give a terrible reading, it’ll still be a great event. But I don’t plan on doing that. Thanks to editor Dustin Holland (a.k.a. Archey Caane) for a fine 2 year and 23 issue run. Here’s the latest and last installment, featuring my “Et Tu?” and a lot more. I hope to have it all together by midweek. In Februrary 2011, Lix and Kix produced a 150-hour poetry marathon — Snoetry 2: A World Record Winter Wordfest — at Jim’s Coffeehouse and Diner in downtown Elyria. Dianne Borsenik and I emceed most of it, many others helped, and poets from all over (probably a couple hundred in all) came to participate. Early that Sunday, Nick Wilkinson brought his film crew from Akron to capture some of the event. Last night, I saw this video for the very first time. This is actually the shorter of two versions Nick Wilkinson shared with me. In it you can catch glimpses of Zach Ashley, Azalea Tidwell, Cornelius Bent, Christopher Franke, Lenore Ireland, my co-host Dianne and others. I’ll share Nick’s longer, alternate version in the very near future. Filmmaker Nick Wilkinson, a 2011-2012 Emmy nominee, is also the lead singer/songwriter for Nick Wilkinson And The Featured Players. Find him at www.nickwilkinsonmusic.com. Stay tuned to this blog for information about Snoetry 3 and a Half, which will happen Saturday January 26th 2013 from noon to midnight at Poet’s Hall, 1136 E. Lake Road in Erie, Pennsylvania.